CRP features on episode four of Stockhouse’s “Companies to Watch”. CRP CEO Chris Castle features at 5:41 to 7:33. Chatham Rock Phosphate Limited (TSXV: NZP, NZAX: CRP) aims to be the premier supplier of direct application phosphate to the New Zealand and global agricultural sector. At PDAC2019, we learned from Chris Castle, President and CEO of Chatham Rock Phosphate, that their main project, called Chatham Rise project, is located off-shore of New Zealand. It has a resource of 23.4 million tons of medium -grade rock phosphate, a mining permit, and a business partner for mining. The Company is currently working on raising funds to reapply for an environmental permit, which it expects will be granted in 2021. Mr. Castle expects Chatham to be in production in 2023. It has been a matter of speculation for many years that the seabed of the Chatham Rise, off the coast of New Zealand, may represent an untapped source of Rare Earth Elements (REE). This intriguing concept was based on historic sediment samples from the area indicating significant content for this group of elements. Independent research by the United States Geological Survey has now confirmed that REE occur across a wide section of the seafloor holdings comprising the Chatham Rock projectarea and conceptual estimates for deposit size have been presented. With the planet’s population surging past 7.5 billion, you might expect steady demand for crops and also for the fertilizer that’s essential for crop yield. Farming isn’t that easy. The mid-decade crash in grain prices threw the big agriculture stocks off the bull market’s back. And even as farm icons like Deere have regained favor in the past two years, investors kept a wary distance from fertilizer sellers CF Industries Holdings, the Mosaic Co., and Nutrien—concerned that new producers would weigh down pricing. NIWA (National Institute of Water and Atmospheric Research) has launched one of its most challenging scientific underwater experiments this month on the Chatham Rise. Chatham Rock Phosphate said that this expedition is particularly relevant to its proposed marine phosphate recovery operation on the Chatham Rise. At least nine separate specialised pieces of equipment will be deployed from NIWA’s research vessel Tangaroa, in water up to 500 meters deep. As world population levels continue to grow, the need for more food has also increased fertilizer demand. Phosphate is a critical component of fertilizer, and the application of phosphate rock to soil is considered a superior organic form that also contributes benefits for soil ecosystems. 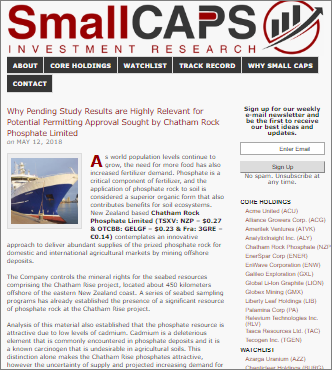 New Zealand based Chatham Rock Phosphate Limited (TSXV: NZP – $0.27 & OTCBB: GELGF – $0.23 & Fra: 3GRE – €0.14) contemplates an innovative approach to deliver abundant supplies of the prized phosphate rock for domestic and international agricultural markets by mining offshore deposits.